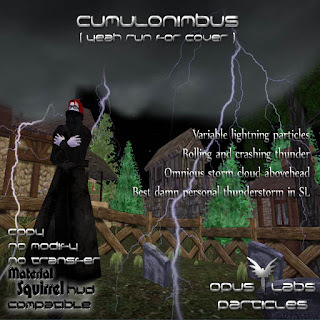 Comes in 2 versions, the "cumulonimbus" (seen above) which is a standalone, and a "thunderstorm" add-on effect for the SFX hud. Storm Ahoy! and you will get a "object missing from database" error if you try to REZ the product. If this is happening to you, please drop an IM to DrenBoy Opus for a replacement within the same month.